After members of the 2018 Bethesda Big Train departed from Shirley Povich Field as the Cal Ripken Collegiate Baseball League co-champions, there were still awards to be handed out. Manager Sal Colangelo chose five players for this season’s awards: most valuable player, most-outstanding hitter, most-outstanding starting pitcher, most outstanding relief pitcher and most outstanding utility player. “It was tough,” Colangelo said about choosing an MVP. “This [was] probably the toughest year ever to pick awards, because we had so many guys that shined. 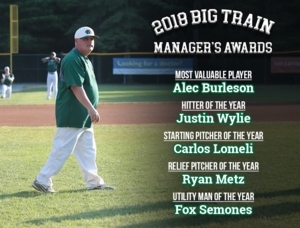 Colangelo chose two-way player Alec Burleson (East Carolina) as the Big Train’s most-valuable player. Burleson joined Bethesda a week into the season, but by the end led the team in home runs (10) and RBIs (44) while ranking second in average (.385) and OPS (1.220). On the mound he worked a 0.34 ERA in his four games started, pitching a total of 26 1/3 innings, striking out 23 and giving up only one earned run. Burleson’s stats weren’t the only reason Colangelo chose him as MVP—to him, whether Burleson was in the field, pitching or batting leadoff, he was a leader on the team. Going into the summer season Burleson expected to have a more individually-focused experience, but said that he came out of the season having learned more about playing for his teammates. Outfielder Justin Wylie (Arizona) was awarded most-outstanding hitter, after finishing the season with team-and league-high .417 batting average, with 45 hits, 25 RBIs and one sacrifice fly. With his .417 mark he set a new record for highest batting average in the Bethesda Big Train franchise history. When asked what his most valuable lesson from the summer was, Wylie joked that it was to “try and win in two games if you’re playing a best two-out-of-three series so you’re not co-champions.” In the end, Wylie wanted to thank the coaching staff for bringing him to the team, stressing that he thoroughly enjoyed his time in Bethesda. Starting pitcher Carlos Lomeli (St. Mary’s CA) got the call to start five times over the summer, working a 1.76 ERA and leading the team in strikeouts (37). Colangelo selected Lomeli as the most-outstanding starting pitcher because of his consistency. Ryan Metz (Virginia Tech), dubbed by Colangelo as the Big Train’s “silent reliever” on the mound, was chosen as the most-outstanding relief pitcher. During the regular season he worked a 0.00 ERA, the lowest among all pitchers, giving up only one unearned run. Finding a routine that works helped Metz stay consistent over the summer, and he hopes to carry that routine over into his work at Virginia Tech. Junior Fox Semones (James Madison), a key player for the Big Train, settled at second base but took turns at shortstop, third base and in the outfield when he was needed. His ability to play any field position solidified him as the most-outstanding utility player. Semones ended the regular season batting .283, with 30 hits, 23 walks and 15 stolen bases. Semones was grateful that Colangelo chose him, saying that though he won’t go and tell anyone, it felt good to be chosen and recognized. For him, the connections he made over the summer taught him about friendship and teamwork. Congrats to these five players and all the 2018 Big Train players on a tremendous seaosn!